What does it mean to follow Jesus and what exactly does that look like? There is a common perception that following Jesus is about believing the right things about Jesus or being in agreement with what the Bible teaches. Although these things are important, they are grossly inadequate in defining the life that Jesus invites us to experience as we follow Him. The invitation of Jesus to follow Him is the transformational decision to know and experience God’s love and power in our lives as we live out our faith in community with other followers. What is so often missing in our lives is not a piece of knowledge or “secret” that unlocks our spiritual potential. What is missing is the relational partnership that God intended to be a regular habit of our lives. Although much is made about the need for churches to provide places for fellowship, community, and relationship, the reality is far different. Much of the modern approach to church is centered around programs, activities, and numerical growth. Church attendees are spectators or program leaders, but they are still alone. Most church attendees never develop deep, meaningful relationships. Each of us needs to be known and to know others. Our goal is that FORMUS can be used as a tool to help facilitate the deep, meaningful relationships that each of us desperately needs. 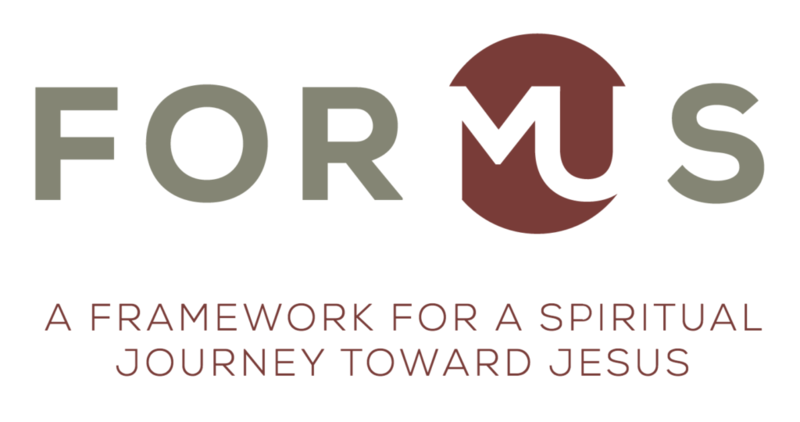 FORMUS is a framework for a journey towards Jesus. Jesus said, "By this will all men know that you are my disciples if you have love one for another." (John 13:35) FORMUS focuses on living out our faith through our words and actions. Far too often, discipleship is defined in terms of theological knowledge or what we know. Instead discipleship is a spiritual journey towards knowing and living out of our relationship with Jesus. Because real discipleship always happens in community, FORMUS is about sharing life with others around the teachings of Jesus. These relationships, when they are authentic and real, will allow life application of Scripture instead of just getting the right answer to a question. Ultimately, our spiritual growth should be measured by how we express God's love to those we know best. The good news of Jesus must first impact our closest relationships if it is to impact our community. "FORMUS has not only allowed me to grow spiritually, but I gained a mentor that I now call my friend. I am given a different perspective on how to handle my struggles because of our conversations. It's transformed my life and my spouse's life and made our marriage stronger because we now put God at the center of our relationship." Does this sound like something you're looking for?